There is such thing as a LOW-CARB CRUISE LINE. Hold the phone. A Royal Caribbean cruise. Named after carbs (or the lack there-of). I die. So who wants to share a room? 2015 will go down as the year that officially killed carbs. Gluten is the new Voldemort. Unless you’re a muffin or a donut or a bundt cake made with almond or coconut flour, YOU CAN’T SIT WITH US. Nut flours are in, glutenous flours are out. Whether you’re allergic or just anti, it’s clear as day that gluten just isn’t cool anymore. Toss it in the pile with neon scrunchies and pogs and Pokemon and other things we thought were totally rad until they just weren’t anymore. Poor things. If I were to create a high-carb cruise line, would you guys set sail with me? Maybe I could partner with the Disney Cruise and make all the characters walk around wearing necklaces made of Cheerios. Let’s tackle the real questions here. Why is wheat so vilified? Who is this terrorist they call gluten and why is he making everyone so pissed? You see, in order to boost yields and disease resistance, breeders created hybrid varieties of wheat. There are new strands of wheat and there are strands that contain more gluten than others, which some say makes the wheat more difficult to digest. Now before everyone gets up in arms about hybridization and GMO’s, please realize that efforts such as these are often a result of having to feed the eight billion people on this planet efficiently and effectively. We’re always working to minimize world hunger and feed our rapidly growing population, a huge issue that we tend to forget about. As a health professional, I feel it’s my duty to shed light on that perspective. I know I’m going to get hate mail for saying this (I will be deleting any negative commentary left on this post, so please respect that this is a positive space), but we cannot realistically feed that many people with organic broccoli (though that would be pretty great). While celiac disease has increased in the last 50 years, it is by no means proven to be the result of wheat hybridization. Wheat has been part of the global diet for thousands of years and breeders have to constantly work on improving its integrity and sustainability. This is a science that has quite literally saved thousands of lives when it comes to combatting world hunger. I don’t work for the wheat association. Is that even a thing? I just like whole grains, as does my brain. Do we eat too much refined white flour? Yes. Do we eat too much refined white sugar? Hell yes. Is the protein found in wheat, rye, and barley making us all fat, sick, and ugly? I think not. I know there are hundreds of books out there demonizing gluten and scaring you into eating solely grass-fed beef and coconut oil. Make informed decisions. Avoid scare tactics. I’m sure in ten years there will be a fun new food to hate on! So who wants to talk about pasta?? And pasta sowwwce. You guys. This is one of the best recipes I’ve ever made. I actually, physically smiled after the first bite. A BIG TOOTHY GRIN. My dentist would be proud. You bake the uncooked pasta in the oven so it’s such a breeze to make. When I say you absolutely have to make this, I mean it. 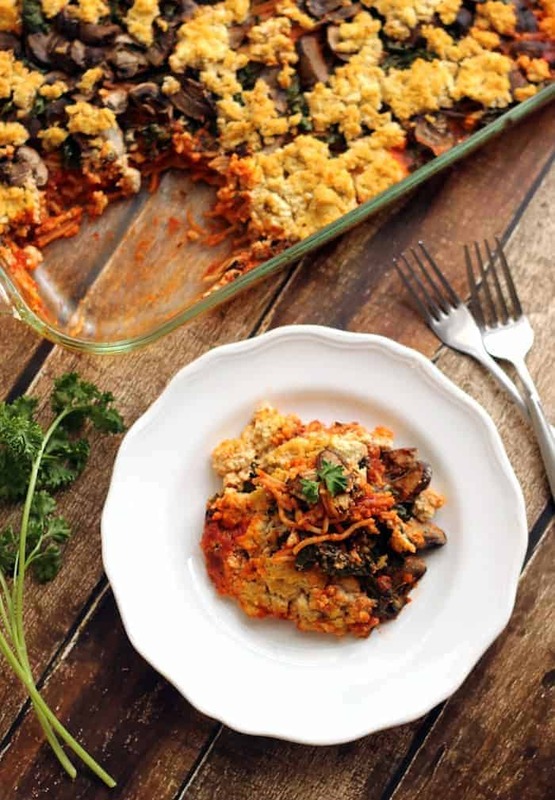 The tofu and hummus mixture is from my Skinny Vegan Lasagna, which multiple readers have named the best lasagna they’ve ever had, meat and dairy versions included! You’d never in a million years know you were eating tofu. It tastes more like ricotta than ricotta does. 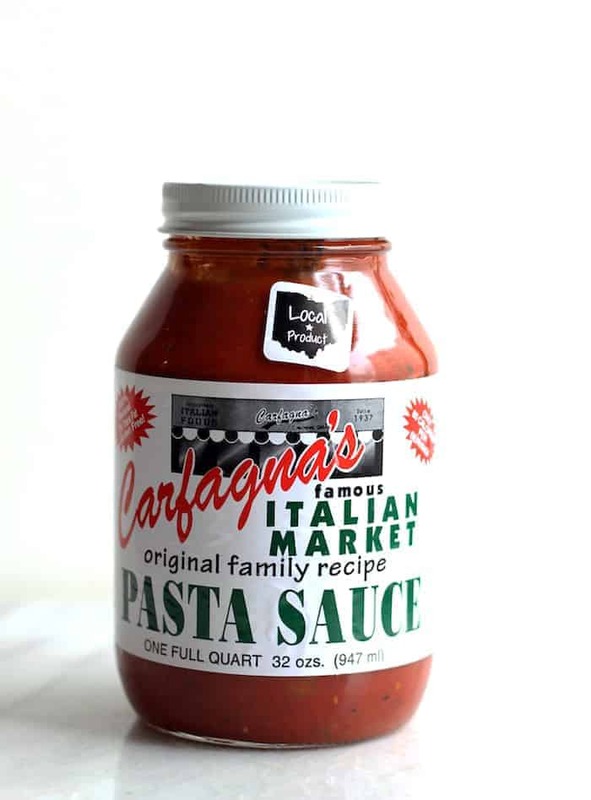 I used my all-time favorite local Carfagna’s pasta sauce and this whole wheat spaghetti, but use whatever noodles you fancy. No matter what you use, it’ll be super filling and satisfying and foodgasmical. Brown rice noodles, spaghetti squash, zoodles, roodles, moodles, whatever. Just make it happen. Crumble pressed tofu and place in a medium bowl. Add hummus, nutritional yeast, garlic, salt, and pepper. Use your hands to combine mixture. It should be moist and resemble ricotta cheese. Set aside. Preheat oven to 350F. Spray an 9x13in glass baking dish with cooking spray. Place uncooked noodles in the pan, criss crossed. I broke most of the noodles in half. It will look like a messy layer of noodles, and that’s ok! Cover noodles evenly with the jar of pasta sauce followed by the water. It will look soupy–that’s normal. 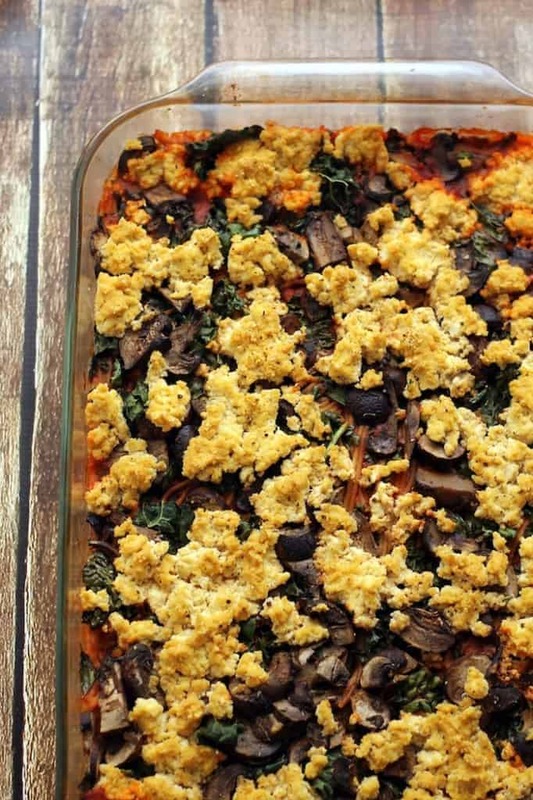 Top with mushrooms and kale, then sprinkle small handfuls of the “ricotta” evenly on top. Season with a dash of salt and pepper. Bake for 40 minutes. Remove from oven and allow pasta to “set” for 15 minutes prior to serving. Great post! It’s so easy to jump on a bandwagon and say wheat is the devil. The problem is so many people stop eating wheat and replace it with highly processed gluten-free “products.” Those can’t be better for your body, right? Anyway, I don’t know what I’m going to do because I have like 72 recipes of yours on my list that I want to make. It’s time to get cooking! This looks seriously good! I couldn’t have said it better myself! Promise me that out of the 72 recipes you have on your list you’ll start with this one. It’s epic. The kids will love it! This is a great post! I agree that our society eats too much refined flour/sugar but whole grains are not bad! I love eating ezekial toast (not gluten-fee) at breakfast and enjoy a good healthy pasta dish every now and then. I can’t have cheese though – it makes me feel horrible! So, this tofu ricotta is really interesting! I always see vegan cheeses made from nuts, but I haven’t tried tofu yet. Thanks for this delicious recipe! Ezekiel toast is a staple! You’re going to be obsessed with the tofu ricotta–I guarantee it! Haha! Gluten is sooooo 2001. Love this dish lady–perfect for dinnaaaa! Perfect for breakfast, lunch, AND dinnaaa. AAAHHHH! Love the blog entry and the recipe. I make a lentil baked spaghetti that my meat eating brother in law has said is his all time favourite supper!! So, I’ll definitely be making this. Just watched “The War on Wheat” and found it quite informative. Here it is. Thanks a bunch, Darla! I love love love the idea of adding lentils! Nom Nom! That looks so good and perfect for this rainy cold and dreary day in Houston…I’m coming over and I promise to bring the wine and a really good loaf of crispy Italian bread…BRING IT CARBS! It’s been freezing rain over in these parts as well…please bring a bottle or four of wine thank yewwwww. Thank you thank you thank you! I’m all about avoiding overly processed foods, but I just can’t handle the scare tactics some books and programs preach. It’s important to know your body, what it likes and what it doesn’t, but just because someone else doesn’t do gluten or grains doesn’t mean they are evil for you. EXACTLY. If you can tolerate it and it has nutritional value, why not?! Praise hand thrashing around obnoxiously at you telling people gluten will not make then die. Plus, these recipe looks amazing and absolutely freezer friendly! I’m digging it. I fully welcome your grammatical errors :) You need this in your life!! POKEMON ARE STILL TOTALLY COOL. Not that I secretly love when I find a random card from back in the day around the house or anything……. I think this looks so tasty! Pasta is the bee’s knees. Bahahah major LOLz over here. Poor gluten. It gets such a bad reputation. I would be sick and fat if these scare tactics were true. Pasta will always be welcome in my belly, especially the ones loaded with tofu, kale and mushrooms, YUM! Iknowright?! Pasta belly = the best kind of belly. Such a good post! I was once that person afraid to eat wheat and other gluten containing foods as I was paleo for almost 2 years (after I was a vegetarian for 5!!). I soon realized that I was denying myself some of my favorite things (hummus, beans, greek yogurt…). I now just focus on eating whole foods and enjoy what I like and makes me feel good (ezekial bread, hummus, and what not). Moderation is definitely something that we need to start to preach. Man oh man, you went from paleo to the veg life? Quite a switch there! I agree–focusing no whole foods is always best :) Good for you! You are so welcome, my dear. I see some gluten-free baked spaghetti in your near future!! With a glass of kombucha on the side, obvi. I would totally go on your high-carb cruise. Give me ALL THE CARBS, all the time. I cannot wait to make this! Can I come with you?! LOL, pogs. I don’t remember the last time I thought about those. Loving this recipe! I made pasta for our lunches this week. I haven’t made pasta in FOREVER. I realized I need to make it more often! This looks amazing! And the tofu ricotta has me super intrigued. Love that you used uncooked noodleys and celebrate gluten. HIgh fives for whole grains and tofu ricotta and delicious ideas!! You basically read my mind with this post. I feel the exact same way about the new grain hating trend. Unless you have a REAL allergy then it just doesn’t make sense to me. Whole grains are the shiz!! Which is why I happen to find this recipe humbelievably insanely delicious. Pinning to try very soon! A low carb cruise line?! Sounds like my nightmare vacation! Whole grains FTW. THANK YOU for talking about gluten on here. Hopefully some people who are confused will read it and have things cleared up for them. I hate seeing wheat so hated upon when the rationale behind it isn’t even true! On another note, this looks fab! Alexis, you slay me with your awesome wit! I LOL’d while consuming my steel-cut oats this morning, causing my children to look up from their equally high-carb and probably gluten-containing breakfasts and ask me what’s so funny. But seriously, you make a powerful and compelling point. I live in a country where food security is not a given, and probably 33% of the population lives on less than $2 a day. They don’t have the luxury of wondering whether gluten is making them fat, sick, & ugly… they just want food in theirs and their kids bellies. I would even venture to say that our obsession with gluten (-free) is an FWP. So… I made your excellent pasta this afternoon and can hardly wait to dive into it tonight! Thanks for another amazing recipe and amazing post. You rock! Bahahahaha speaking of funny…YOUR comment made me LOL! I have the best picture in my head of your kids looking up from their oh so glutenny breakfasts. I hope you loved the pasta in all its glutenous glory! Wow, so much alliteration going on. I’ve surprisingly never baked spaghetti before.. thanks for the inspiration – it’s definitely something I must try! you are so insensitive to those whom are gluten intolerant, like Hagrid and Professor Sprout. I’ve made it my mission to leave the most random, useless comments here. Oh it looks delish. Spaghetti = delish. I’ll make this with those worm zero calorie noodles. Your comments slay me. Like I feel like I can’t even fathom a worthy response. I just, like, luh you. Bring on da worms. Thank you for schooling us all. I admittedly got a little caught up in the anti-gluten hype awhile back. It didn’t last long, though. I blame reading too many blogs and publications that tout themselves as “healthy living” when they’re anything but… but that’s a rant for another day. Anywho, all that to say, I actually feel worse when I DON’T eat gluten. So, bring on the whole wheat pasta! This looks delicious. I have so many recipes of yours that I need to make like..now. A high-carb cruise? Heck yes. Where did you say I had to sign up? I’ll do it while eating crackers so never mind the wheat-containing crumbles on the form ;) . And you will be cooking all meals on board, right? ‘kay, just wanted to make sure this casserole would be on the menu. In exchange, I’ll try to find my brother’s old Pokemon cards and bring them along. Deal??! Okay, last but not least: I will definitely (!!) try this recipe. Just wait until I’ve moved and can buy more food again. Looking at this I.can’t.wait. Thank you so much for saying that! It’s so refreshing to hear a stance about GMOs from a global health perspective. You’re so welcome, Angela! I’m happy you appreciated my perspective. 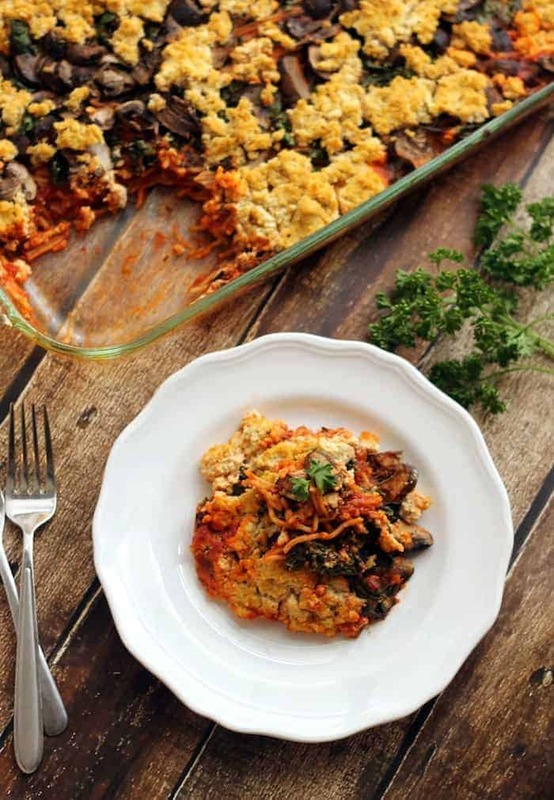 I made this the other night – it was so easy to put together and the flavor was incredible!! Best new recipe of 2015 so far :)) thank you! Yayyyy!!! So happy to hear that! This looks delicious! 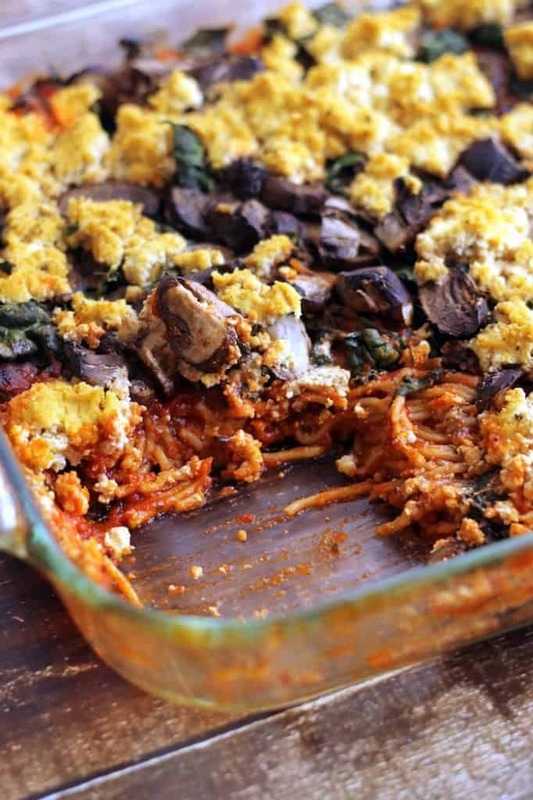 I love healthy pasta bakes right now, especially with butternut squash. As you might expect, the demand for meat is a major concern, as we divert so many resources to grow meat. I hope you find this info helpful in your work, and thanks for the great recipes! Mmmm I love the idea of using butternut squash here! Awesome! I made it tonight using a bag of frozen kale that I defrosted and it worked perfectly :) Yay for recipe successes! Thank you so much for this post! I really love it when a well-informed professional can cut straight through all the nonsense (and especially in such a humorous way!) to set the gluten and ‘carb’ issue straight. If there was a high-carb cruise I would be there with bells on! Can’t wait to try this recipe, I think it will be on my to-do list for the weekend. You’re so welcome, Emma! Sometimes you gotta just cut to the chase :) A little laughter never hurts, either! Enjoy! Yayyy!! Isn’t it so yummy?! Amazing! Fast, easy and soooo delish. Yay!! I love how fast it comes together. Made this after hearing so many raves (and I used sauce I love), but mine turned out super plain-tasting. Husband won’t eat it so I’m trying to doctor it up with extra garlic powder, salt, and herbs with each reheating. Maybe the extra water diluted the sauce? I liked the texture of Elise’s tofu-hummus ricotta so I might try it in the lasagna as per your prior post, but maybe with more nutritional yeast, hummus, salt, and garlic powder. Hmmm that’s so odd! As long as the sauce is flavorful, the pasta should be flavorful. The water is used for cooking the pasta. Sorry to hear it didn’t turn out great! Update — I reheated this dish with extra garlic powder, salt, and nutritional yeast + a little water to keep it from sticking to the pot. I also “stole” extra tofu ricotta for each batch as that was my favorite part. Improved it somewhat, until one day I forgot it on the stove, where it stewed for entirely too long. Some of it burned on the bottom of the pan but the rest of it tasted AMAZING! The ricotta and all of the flavors melded together and the texture was a little like a vodka penne sauce because the ricotta became very creamy and mixed with the sauce. Not sure I could reproduce that in a layered baking attempt, but I just loved it all mixed together so maybe I will make again and bake covered to lock in moisture. Thanks! I am definittely making this tonight. I made the lasgna version a couple of months back, and even my brother in law went back for thirds. However, I will be using rice noodles. No gluten – on doctor’s orders. I do think it would have bee kind if you had acknowledged that a significant numer of people genuinely cannot safely ingest gluten. Your approach allows people who have not done their homework to scoff at those who need to avoid certain foods. I have often been treated to: Oh, a lttle won’t hurt! (Yes, it will), or Don’t be silly; that’s just a fad (Not for me, unfortunately), or Oh yeah, there’s flour in that; I didn’t think it would matter (Fine,don’t mind me. I’ll be the one over here in the corner wishing I were dead). I appreciate your focus on healthy eating and the great recipes you share. But please consider the affect of your wit on some of us. I’ve been wanting to try this recipe for ages, and I finally got around to it this week! That tofu ricotta…oh ho ho. I could eat that stuff as a dip it’s SOO good!! I used some brown rice pasta and it kind of solidified into a rather chewy layer or lump…but it’s still a tasty dish and I will be making it again, net time with whole wheat spaghetti. Thank you Alexis, you rock! you have hit the nail to the head. I made this tonight and must say, I was disappointed. It was bland, needed more flavor. I’m said to say I won’t be making it again. Well, I am a celiac, so I can literally die from eating wheat/gluten. That being said, I am always shocked when people respond to the discovery that I am GF by saying: “Oh, I should go GF too, its so much healthier.” ??????????????? I try to explain to people that that isn’t necessarily so. The GF pastas, bread and cookies I have to eat tend to have a much higher glycemic index because they are made from rice flour (often white) etc instead of hearty whole grains (although the selections are getting better as time goes on.) A nice touch from you, however, would have been to make a comment such as “If you legitimately can’t eat gluten without getting seriously ill, you can still enjoy this yummy pasta recipe by substituting a GF pasta, such as one made with quinoa, corn or rice.” I know you were just standing up for wheat, but you don’t know how badly a lot of us celiac’s get treated because of the GF “fad” and the starting backlash against it. For me, GF will never be a fad, it is the only way I can stay alive. OMG YUM! I just made this and it is sooo good! For anyone reading this and on the fence about making this, DO IT! the tofu ricotta was amazing! I would cook it for a few minutes longer next time to get a really crispy top. I used spinach instead of kale, but since it cooked down so much I wish I would have added more. Definitely be making this again, thanks for the recipe! I might try adding black olives or fresh basil next time. I made this tonight and it turned out SO soupy! :( I think it would be excellent if there wasn’t so much water diluting the sauce. Honestly, I think I need to try again and either REALLY reduce the water (one cup instead of 2.5). I had even used more pasta than the recipe called for, so I was so surprised it didn’t turn out nice and thick like in the pictures. Alexis is always sharing such amazing recipes, I can’t let this one go. There will be an attempt #2, and hopefully with a more delicious ending! Hi, Alexis. Thank you so much for the recipe — I am excited to try it! Quick question: if I were to make this with leftover/precooked pasta, would you recommend omitting the 2.5 cups of water? Thanks again. This is going into the regular rotation for sure! Thank you! !